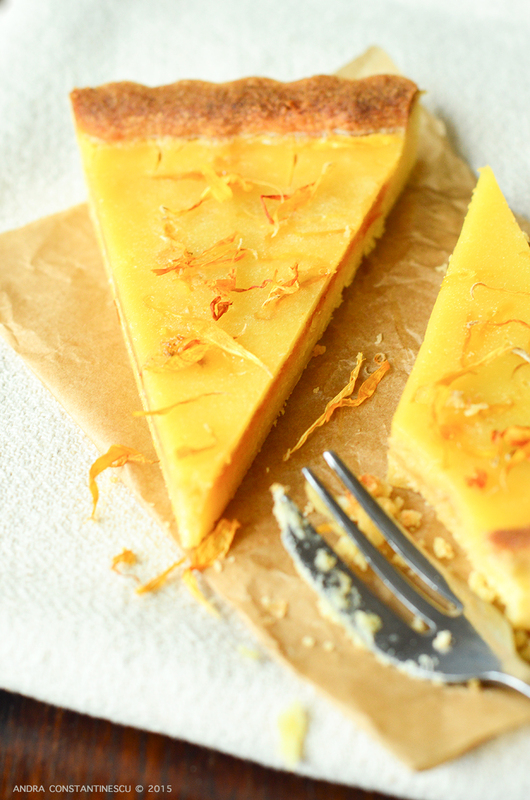 – the base is a sweet short pastry, made with butter, icing sugar, egg yolks, a pinch of salt, some lemon zest and flour. The secret here is to handle the pastry as little as possible, to rest it in the fridge and to blind-bake it before adding the lemon custard. I usually leave it to rest in the fridge for about 30 minutes. After I take it out of the fridge I leave it for a minute or two to soften a little – it makes it easier to handle and roll. Ideally you should roll it to a 5 mm thickness, but don’t worry if you get it a little thicker, simply add a few minutes to the baking time and it should be ok.
– the lemon and marigold custard is basic: lemon juice, eggs, sugar, double cream and dried marigold petals. Mix the ingredients with care, and make sure that the custard doesn’t boil while it’s in the oven. Sift the icing sugar in a mixing bowl, add the softened butter and mix them together without creaming them. Add the egg yolks, salt, lemon zest and sifted flour. Combine all the ingredients together, using your fingertips, until you get a soft but not sticky dough. Place the dough on a piece of cling film, flatten it to about 1 cm and leave to rest in the fridge for about 30 minutes. Take the dough out of the fridge, take it out of the cling film, place it on a lightly floured surface and leave it to rest for 2 minutes. Using a well floured rolling pin, roll the dough until is about 5 mm thick. Wind the dough on the roller pin then unwind it over the flan. Gently push the pastry trough the edges, then cut off the excess pastry. Place the pastry in the fridge for 15 minutes. Line the pastry with parchment paper and add the baking beans. Bake the pastry in the oven, at 190 degrees Celsius, for 20 minutes. remove the baking beans and parchment paper, reduce the oven temperature to 180 degrees Celsius and place the pastry back in the oven for another 15 minutes. 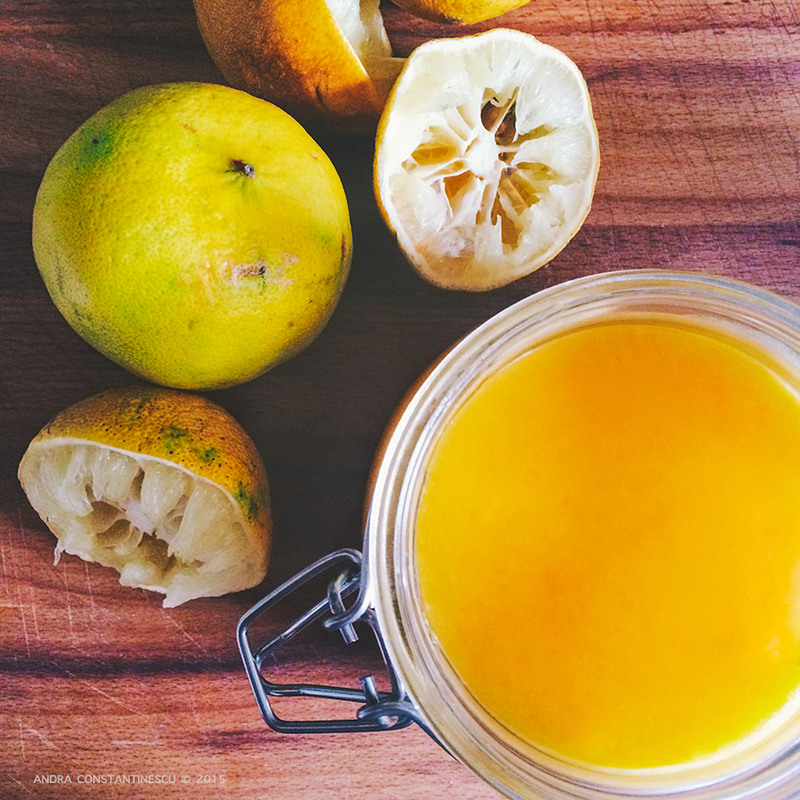 Juice all the lemons, strain the juice in a small pan and leave it to simmer on low heat until it reduces by half. Leave it to cool completely. In a large mixing bowl, break all the eggs and lightly whisk them with the sugar. Add the cream and continue to whisk gently until combined. Mix in the cooled lemon juice and then pass the custard through a fine sieve. Add the dried marigold petals, cover with cling film and place it in the fridge. Reduce the oven temperature to 140 degrees Celsius. Fill the pastry case with lemon and marigold custard and bake for 20 minutes. Make sure that the the custard does not boil or puff (adjust the oven temperature if necessary). Reduce the oven temperature to 12 degrees Celsius and continue to bake for another 15-20 minutes, until the custard is set. 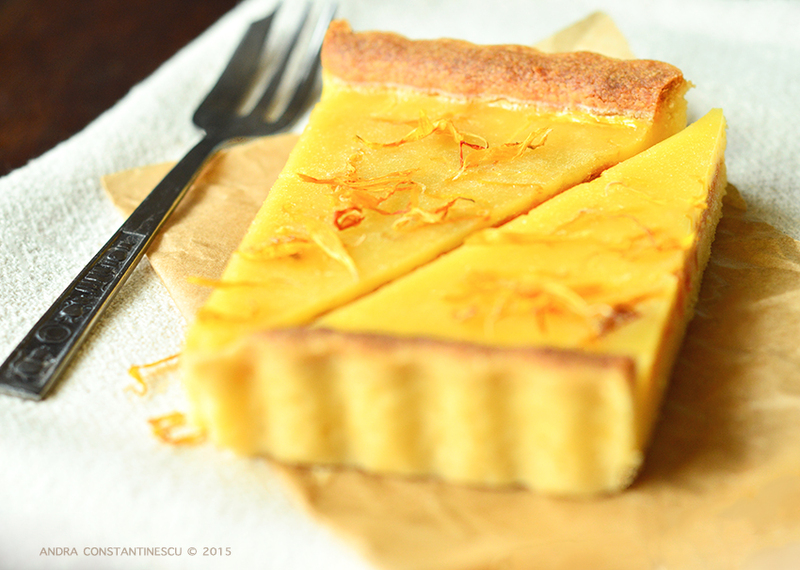 To serve, allow the tart to cool completely, then cut thin slices using a sharp wet knife.